My heart is broken that our time together was cut short but I thank the higher power that the Friday night in July when I met Murad we were in the right place at the same time. He gave me so much passion and love in only six months. The intensity of our relationship was overwhelming at times but always left me wanting more. I believed we had lots of time to channel our energy into something incredible and I hesitated at times at the start to jump in completely. I think Murad knew his time here was limited therefore tried to live and love as much as he could as often as he could. I know I was profoundly loved and he knows he was too. Not just from me, but from everyone he touched. Every 'heated debate' was always ended with Murad saying, "this is a package deal, take it or leave it". I was amazed how unapologetic he was for who he was and what he was passionate about. It is one of the things I loved about him the most. Murad was a bright light in a dark room - you had to squint to look at him directly, he was that shiny - and he illuminated everything and everyone around him in a wonderful glow. I believe I had the fortune to connect with a soulmate. I was even luckier that he was one of the oldest souls one could ever meet. Out of interest, I googled the key signs of an old soul. How many of these described Murad? I think pretty much all of them. *giving and caring, often putting others first. *having a difficult romantic life often with much pain and disappointment. *more than likely to have a soulmate relationship. *things just seeming to happen to him and around him, often becoming very dramatic through the seemingly extreme reactions of others. *having trouble connecting with family. *having some psychic intuition and just 'knowing things'. *finding that he has deeper emotions and passions than most people. *people having extreme reactions to him - some just adoring him and some seeming to dislike him yet he behaves the same to everyone. *having an inner creative passion. *feeling he doesn't have much free will, like life is being controlled by some outside force. *often feeling 'stuck' like events keep on happening time after time. The journey of all of our souls through their many lives is one of growth and learning, from a young soul focused on material things, power, ego and the 'now', to the old soul's higher levels of compassion, truth, destiny, caring, and fairness. Murad's soul was certainly an experienced one. The main reason soulmates have to part is so that the less developed one catches up with spiritual awakening, connection to his real soul age, and to reconnect with their soulmate to continue the journey at the same level sometime in the future. Murad taught me so much; how to be vulnerable, how to be resilient, how to be loved, how happiness can be achieved by making those around you happy as well, how to accept that many things are out of our control. He was the oldest of souls. I was so fortunate to have met my soulmate in this existence albeit briefly, have a crazy exchange of new experiences, knowledge and lessons in preparation for the next time we meet. I've never felt so loved in my life and I've never loved anyone so much before. It was destiny that we met and had this incredible journey together. I know he's out there somewhere making other souls look beautiful, surrounding himself with joy and colour. May the higher power bless you MuMu. I will never forget you, the lessons you taught me, the experiences and emotions you opened me up to, and I look forward to the next time we see each other. My MuMu didn't make it out of ICU and passed on yesterday afternoon. As most of you know he was in the hospital since December 22nd but had been appearing to improve until a sudden downturn in his condition at the end of the past weekend increased in severity and graveness. It's still a shock and frustrating that our storybook together which just got started will now not get written but I feel so blessed to have met such a remarkable guy who impacted my life in so many ways for such a brief intense period. I take solace in knowing he's not in pain anymore and reunited with his mom which he wanted more than anything. I'm so blessed to have such a wonderful network of family and friends. You truly know what matters in life during times like this. I will probably be offline for awhile. Thank you everyone for your support. Get your fetish on! Happy Fetish Day! Short track skating is mass start racing on a smaller rink, normally the size of an ice hockey rink. In competitions, multiple skaters (typically between four and six) skate on an oval ice track with a circumference of 111.12 m. The rink itself is 60 m by 30 m, which is the same size as an international-sized hockey rink. Distances are shorter than in long track racing, with the longest Olympic race being the 1500 metres. Races are usually held as knockouts, with the best two in heats of four or five qualifying for the final race, where medals are awarded. Disqualifications and falls are not uncommon. The sport originates from packstyle events held in North America, and was officially sanctioned in the 1970s, becoming an Olympic sport in 1992. 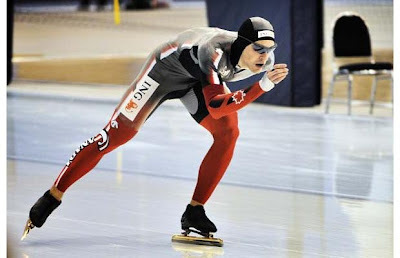 Although this form of speed skating is newer, it is growing faster than long track speed skating. 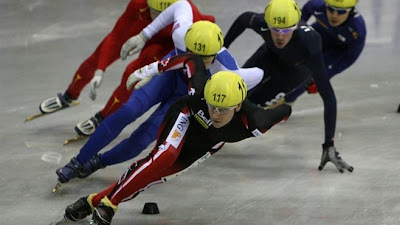 Short track speed skating is an elimination event in which athletes race in packs and try to outskate and outwit fellow competitors within their heats. Eventually, the field is winnowed down to a handful of finalists and the first one to cross the finish line is the winner. 500m: This four-and-a-half lap race is an all-out sprint. An explosive start is crucial because passing at high speeds is difficult. Individual heats feature four skaters at a time in a mass start. 1000m: A very tactical race. Skaters start out slowly and maneuver for the best position going into the homestretch. The skaters gradually speed up until they are at top speed for the last two or three laps of this nine-lap race. Individual heats feature four skaters at a time in a mass start. 1500m: The 1500 requires great stamina and strategy, since the heats, quarterfinals, semis and final are contested in a single day. Each race consists of 13 1/2 laps and measures almost a mile. Individual heats feature six skaters at a time in a mass start. 3000m relay: The women's relay consists of teams of four skaters who must complete 27 laps around the oval. It is common for each skater to sprint for one and a half or two laps at a time and take multiple turns on the ice. The relay is full of constant passing and spills and is the most exciting event in short track. 5000m relay: The men's relay consists of teams of four skaters who must complete 45 laps around the oval. It is common for each skater to sprint for one and a half or two laps at a time and take multiple turns on the ice. The relay is full of constant passing and spills and is the most exciting event in short track. Boots: Made of fiberglass, graphite and Kevlar, short track boots lace higher up the ankle than traditional ice skates. Boots are typically built using customized foot molds to stabilize the foot and ankle around corners. Blades: To enable the skater to achieve high speeds and control in turns, short track blades are bent in an arc that reflects the direction of the turn. The extremely sharp blades are placed to the left side of the skate so the boot does not touch the ice when the skater leans into the turn. Blades can be a maximum 46cm (about 18in) long and between 1.2 and 1.4mm (about 0.5 to 0.6in) wide. 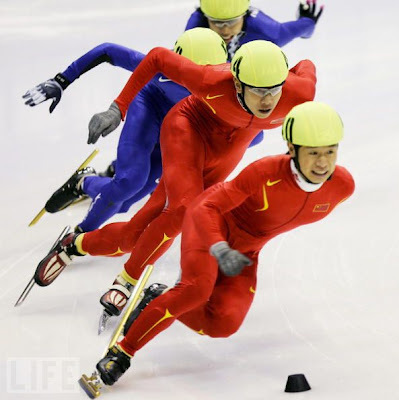 Helmet: Because of the frequency of crashes and falls, short track speed skaters are required to wear hard plastic helmets to prevent potential head injuries. Gloves: Skaters wear cut-resistant gloves to protect their hands from blades. Because the skaters' hands often touch the ice on turns, the gloves are equipped with hard plastic balls on the fingertips that allow the glove to slide along the ice. 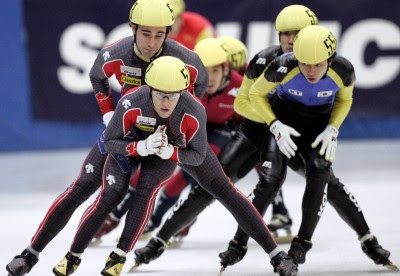 Protective wear: For protection against skaters' sharp blades, short track athletes are required to wear shin, knee and sometimes neck guards for protection. 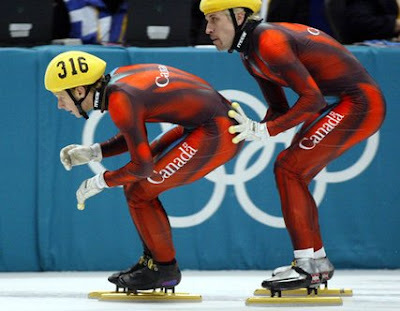 Skin suits: Athletes are required to wear long sleeved, long legged skin suits (similar to long track speed skating's skin suits but without the hood and thumb loops) in competitions. The suits are anti-cut, meaning the material should protect the skaters' most sensitive areas, like the femoral artery, against any encounters with the sharp skate blades. Only a few weeks to go! I managed to book the last room at Helios yesterday for the weekend. M and I will be in Palm Springs from Feb. 3-8, barring any further medical complications. Okay guys. We're just a few weeks away from Winter Warm Up for 2010! And there are just a few rooms left so snag em while they got em. Last year's Winter Warm Up was huge! And this year? Well, is huger a word? Should be. We expect the usual fun and games plus we're throwing the first ever American Rubber Pup Contest. So calling all pups! More details to come but expect this to be a huge amount of fun and rubbery mayhem. 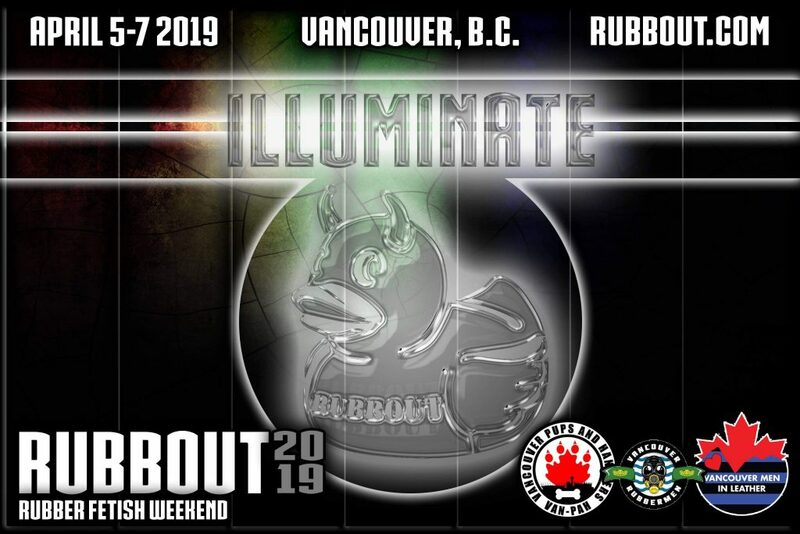 As a huge bonerus, we have Daddy Alan, 1st Runner Up IML 2009 and Pup Nitro, Hotlanta Rubber 2008 both from the super hot Hotlanta Rubber club on hand as well as American Leatherman 2009 Alex Lindsay to put the pups through their paces. And yes we're once again at the hot Helios Resort this year. I mean, who can resist a place with such a great pool and hot tub and dungeon space! We hear the dungeon is even better equipped this year. The dates are February 5 - 7 and rates start at $140. You should book early so you can snag a room at the host hotel. Contact Helios directly at 760.323.2868 and be sure to let 'em know you're with West Coast Rubber to get the room and the special rate. 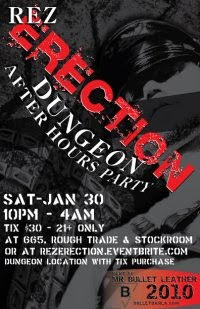 On Saturday, January 30th, the Rez-Erection Dungeon After Hours Party slams into action during the Mr Bullet Leather Weekend in Los Angeles, CA. Doors open at 10 PM and the steamy man on man action rocks until 4 AM. Seriously hot industrial kink music will keep you throbbing all night long in this fully equipped dungeon complete with dark room, full bar and cigar chill lounge. This party is open to guys 21+ only. Tix are just $30 and are only available online at rezerection.eventbrite.com or at local kink retailers 665, Rough Trade and Stockroom. Location with tix purchase. No tix sales at the door! Gear up for this one! Leave your cologne, cellphones, white sneakers and attitude at home. All races are held in pairs, for which two lanes on the track are used. Skaters wear bands around their upper arm to identify which lane they started in. The colours are white for inner lane and red for outer lane. At the back straight, the skaters switch lanes, which causes them both to cover the same distance per lap. When both skaters emerge from the corner at the exact same time, the person currently in the inner lane will have to let the outer lane pass in front of him. This usually does not cause any problems, as the person in the outer lane will generally move much faster then the person in the inner lane. Occasionally, quartet starts are used, for the pragmatic and practical reason of allowing more skaters to complete their races inside a given amount of time. This involves having two pairs of skaters in the lanes at the same time, but with the second pair starting when the first have completed approximately half of the first lap. The skaters in the second pair will then wear yellow and blue arm bands instead of the usual white and red. 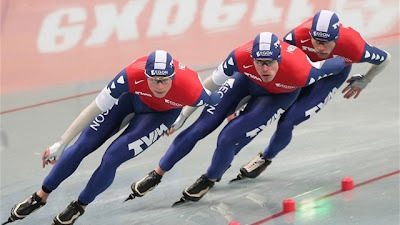 When skating the Team pursuit, the two teams of three team members start at opposite sides of the oval. In marathon races there is usually a mass-start. Dimensions 400 meters speed skating rink.Skaters race on a two-lane oval similar in dimension to an outdoor athletics track. Indeed, an athletics track covered with ice can function as a speed skating track, such as Bislett stadion in Oslo up to the 1980s. According to the rules of the International Skating Union, a standard track should be either 400 m or 333⅓ m long; 400 m is the standard used for all major competitions. Tracks of other, non-standard lengths, such 200 or 250 m, are also in use in some places for training and/or smaller local competitions. On standard tracks, the curves have a radius of 25–26 m in the inner lane, and each lane is 3–4 m wide. There are primarily two types of skates, traditional ice skates and the clap skates. 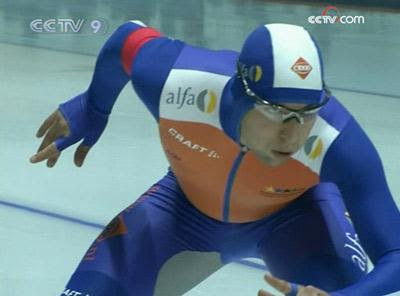 In long track speedskating, only clap skates are used in competition above recreational level. The clap skates were introduced around 1996, and were a revolution in that they are hinged to the front of the boot and detach from the heel, allowing the skater a more natural range of movement. This enables a longer stroke while keeping maximum contact with the ice. 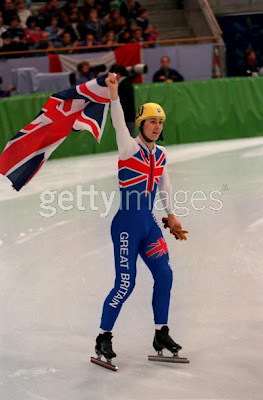 By the 1998 Winter Olympics, nearly all skaters used clap skates. Both use long and straight blades compared to many other ice skating sports. Blades are about 1 mm thick and typically come in lengths from 13 to 18 inches (33–45 cm). Most competitive athletes use lengths between 15 and 17 inches (38-43 cm), depending on body size and personal preference. A lot of attention is given to air resistance. The rules demand that the suits follow the natural shape of the body, preventing the use of e.g. drop shaped helmets (as seen in cycling) or more inventive "Donald Duck" costumes. However, a lot of time and money is spent developing fabrics, cuts and seams that will reduce drag. Some skaters use low (no thicker than 3 mm) "aerodynamic strips" attached to their suits. These are intended to create turbulent flow in certain areas around the body. Glasses or goggles may also be worn so that the wind does not "dry out" the eyes. The oldest competition format still in place is the allround event, standardized in 1892. Skaters skate four distances (for men: 500 m, 1500 m, 5000 m, and 10,000 m) and a ranking is made up based on the times skated on all of these distances. The method of scoring is the same for all combinations. All times are calculated back to 500 m times, so skating the 500 m in 40 seconds gives 40 points, while 1500 m (3×500 m) in 2 minutes (120 seconds, equivalent to 3×40 s) also gives 40 points. Points are calculated to 3 decimal places, and truncation is applied, the numbers are not rounded. The skater who has the fewest points wins the competition. This system is called samalog. An allround champion may often not have won a single distance or he may win three distances but lose the overall title. The ISU organizes an annual World Allround Speed Skating Championships. The sprint championships are two-day events where skaters run the 500-m and 1000-m on both days. The samalog system is again applied to crown the winner. To counter any systematic bias regarding inner versus outer lanes, skaters change start lanes from the first day to the second. Nations with active skaters arrange annual national sprint championships, and the ISU arranges annual World Sprint Speedskating Championships, for men and for ladies, since 1970. 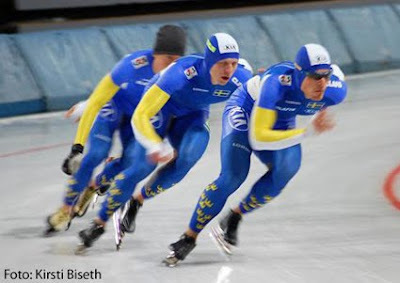 While there are annual European (Allround) Speedskating Championships, no such championships are arranged for the sprinters. A more basic form of speedskating consists of skating a single event. This is the format used for the World Single Distance Championships, which have been arranged since 1996, and the World Cup. 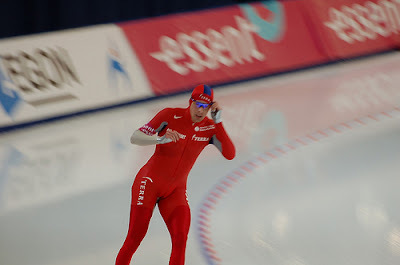 The usual distances are the 500 m, 1000 m, 1500 m, 3000 m (ladies only), 5000 m and 10000 m (men only), but some other distances are sometimes skated as well, such as 100 m and 1 mile. Women occasionally but rarely are given the possibility to skate the 10,000 m, but outside the top-level championships. The 500-m is usually skated with two runs, so that every skater has one race starting in the outer lane and one in the inner. 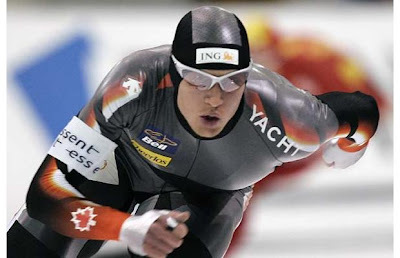 This practice started with the first of the World Single Distance Championships in 1996, and with the 1998 Nagano Olympics; at all earlier Olympics 1924–1994, the 500-m was skated only once. The reason for skating this distance twice is that there is a small but statistically significant average advantage of starting in the inner lane; negotiating the last curve at high speed is typically more difficult in the inner lane than in the outer lane. In addition to international championships, the International Skating Union has organised the Speedskating World Cup since the 1985–86 season. The World Cup works by ranking skaters by cumulative score during the season, for each distance separately, at specially designated World Cup meets. More specifically, there is for each season a World Cup competition for the 500 m, 1000 m, 1500 m, and combined 5,000 m and 10,000 m, for men; and for the 500 m, 1000 m, 1500 m, and combined 3,000 m and 5,000 m, for the ladies. There have been suggestions of making a grand total World Cup ranking by suitable aggregation of scores across distances, but such a ranking system has not yet been organised. 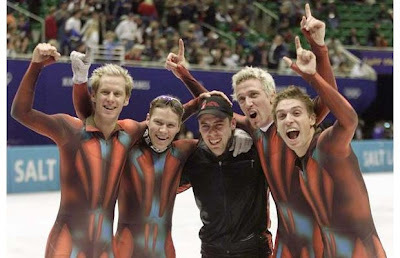 Speed skating is thus the only individual sport with a season-long World Cup not to crown one World Cup winner at the end of each season. The team pursuit is the only team event in top-level long track speed skating and is skated by teams of three skaters. Two teams race at a time, starting at a line in the middle of the straightaway. One team starts on each side of the track. Only the inner lane is used, and the distance is eight laps for men and six for women. There are several formats for the team pursuit. The Olympic format is unusual in that it is a cup format, with several rounds of exclusion between two teams. In the World Cup and World Championships, one race is skated and the teams are ranked by their finishing time. In the Olympic format, a team that overtakes the other has automatically won the race and the remaining distance isn't skated. In practice, the distance is so short that this rarely happens unless one team has a fall. The team pursuit is a new event in major international competitions. Similar events have been skated for years on a smaller scale, but was not considered an "official" ISU event until around 2004. It was introduced at the Olympics in 2006. Skaters skate in a large group and they skate large distances. When conducted at an ice rink oval, the distance is usually around 40 km, akin to the traditional marathon in running. When skated outdoor on natural ice, the distances can be as long as 200 km. An example of this is the famous Elfstedentocht (Eleven cities tour) which is irregularly held in the Netherlands. An example of a famous marathon outside the Netherlands is the International Big Rideau Lake Speed Skating Marathon in Portland, Ontario, Canada.